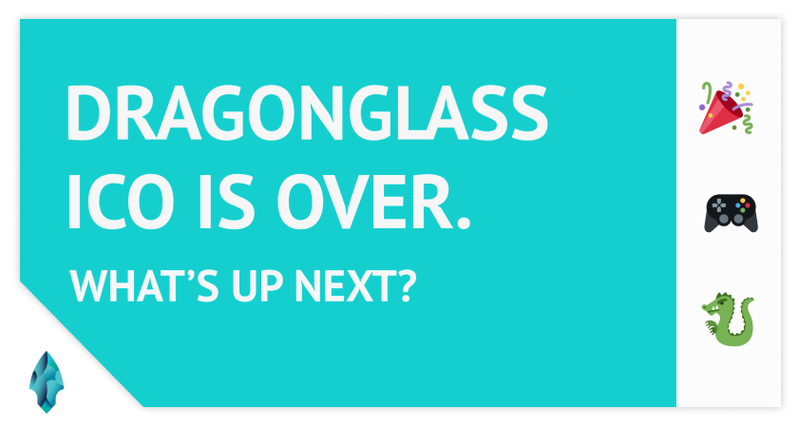 I am very excited to announce that Dragonglass initial coin offering (aka Token Generation Event) has come to an end. That’s it. There will be a maximum of 728,747,635 DGS tokens on the market if everyone mines what they have bought during the sale. All unsold tokens are locked in a smart contract. Our developers are working hard on Dragonglass Platform in order to make it so easy to use that more and more game developers could integrate their games with blockchain without a hassle, focusing on what is the most important — making great games. All the Platform’s main elements are finished, our integration with the Unity game engine is on the final stage of development. Blockchain can be integrated into games just in a few simple steps — and we are going to prove it. We’ll show the demo of it soon, keep an eye on our social media or subscribe to our Developer’s Newsletter and follow us on social media if you want to dive deeper into technology. Being social creatures, we need to leave our super secret underground vaults sometimes in order to meet the sun and communicate with other human beings. The best place to do it is a conference! So, we decided to attend as many as two conferences next month! Meet us at 🍄 GameDev Days in Tallinn on April 11–12 and at the 👾Crypto Games Conference in Minsk on April 25–26. Feel free to schedule a meeting with one of our team members, we will be happy to speak with you and share what we are working on.